Known for its index mutual funds, Vanguard offers brokerage service and exchange traded funds as well. 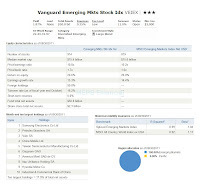 One of the most popular index funds is Vanguard Emerging Markets Stock Index fund. This fund invests mainly in emerging market countries stocks. This fund may be suitable for long term investors who wish to diversify his/her portfolio. More reviews can be found below. 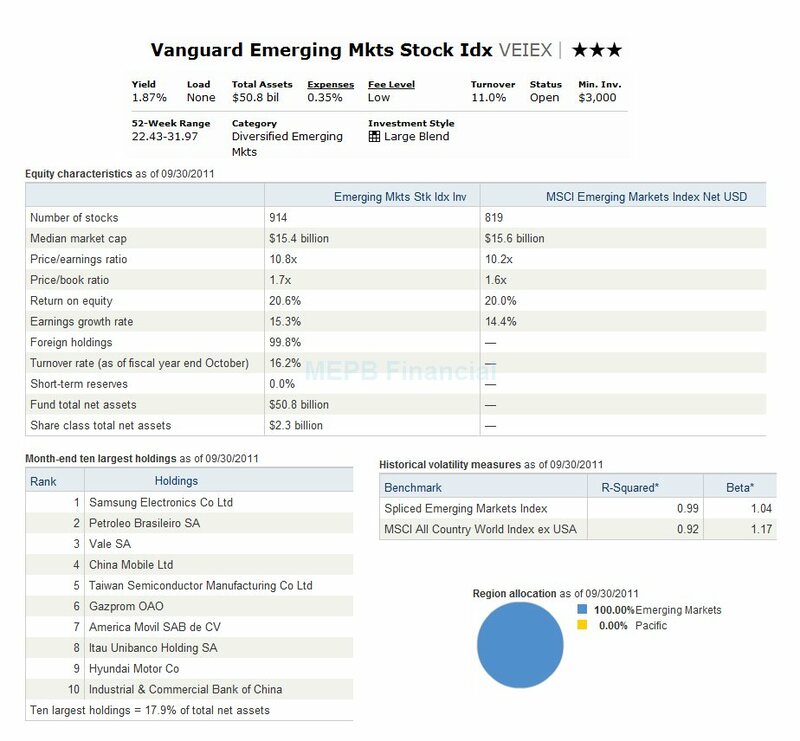 This Vanguard Emerging Markets Stock Index fund’s objective is to track the MSCI Emerging Markets Index performance. This passively managed fund invests most of its assets (>95%) in the stocks included in the index. This Vanguard fund tracks 21 emerging market countries equity returns such as Russia, China, India, Brazil, Korea, South Africa, etc. Please note: This EM equity fund may be more volatile than US domestic stock fund or other developed countries stock fund, though it may provide higher long term returns. As mentioned before, this fund uses indexing approached to manage its assets. The fund’s manager is Michael Perre since 2008. The total net assets are $50.78 Billion. It also has a yield of 1.87%. This fund’s expense ratio is 0.35%. This fee is lower than the average category of 1.67%. As any typical Vanguard fund, there is no sales load. This Diversified Emerging Market Stock fund is rated with 3 stars rating by Morningstar. It has the best 1 year total return in 2009 with 75.98% and the worst 1 year total return in 2008 with -52.81%. This EM stock fund has returned -17.63% over the past 1 year, 4.98% over the past 3 year, and 15.26% over the past 10 year. This fund can be bought from 52 brokerages such as Vanguard, Northwestern Mutual, Schwab Retail, ETrade No Load Fee, Matrix Financial Solutions, Scottrade TF, etc. Investor may buy this Vanguard fund with $3,000 minimum investment for regular brokerage account and for retirement (IRA) account. This fund requires $100 for the minimum subsequent investment. The other class of this fund is the Admiral Shares (Ticker: VEMAX), Institutional Class (VEMIX), Institutional Plus (VEMRX), Signal Class (VERSX), and ETF (Ticker: VWO). The expense ratio of VEMRX is 0.12%. Investing in this fund may include risks such as stock market risk, emerging markets risk, index sampling risk, currency and political risks. As of October 2011, this fund has a total of 914 stocks. The median market cap is $15.4 Billion. The turnover rate is 16.2%. The top 10 largest holdings are Samsung Electronics Co Ltd, Petroleo Brasileiro SA, Vale SA, China Mobile Ltd, Taiwan Semiconductor Manufacturing Co Ltd, Gazprom OAO, America Movil SAB de CV, Itau Unibanco Holding SA, Hyundai Motor Co, and Industrial & Commercial Bank of China.